Video games are, of course, an integral aspect of contemporary culture, with their influence evident in virtually every aspect of the arts and even in education (gamification, anyone?). And yet, if you tried to get a room full of gamers to agree on what constitutes a video game, and which video games were the most important to the development of the form, you might find it surprisingly difficult to come to a consensus. Still, the resulting discussions could be interesting, and anyone who took part with an open mind would probably learn a thing or two in the process. The staff at the World Video Game Hall of Fame have taken a stab at choosing a small number of objects to represent the important developments in the history of the video game. 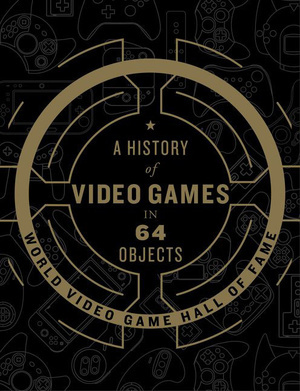 Their work is published as a handsome volume, A History of Video Games in 64 Objects, which attempts to do for the history of video games what the British Museum and the BBC did for the history of the world. That is to say, the authors have chosen a selection of objects from their collection (the Strong National Museum of Play, which contains the World Video Game Hall of Fame, in the case of this volume) which they feel exemplify important aspects of video game history and culture. These objects are presented in chronological order of their creation in a well-designed, thoroughly enjoyable book. The oldest object is a pinball game, Humpty Dumpty, which came on the market in 1947. What, you ask, does a pinball machine have to do with the likes of Tetris and Donkey Kong? Quite a bit, actually: Humpty Dumpty, designed by Harry Mabs and manufactured by D. Gottlieb & Co., was the first pinball machine to include electromechanical flippers that allowed the player to launch and maneuver the ball. That addition to playing Humpty Dumpty gave players a new form of interactive experience, and one that rewarded a player's skill rather than simply a game of chance (e.g., gambling, which helps explain how pinball machines acquired their seedy reputation). The newest object included, video game That Dragon, Cancer, demonstrates how the conventions of gaming can be used to explore real experiences -- far removed from those of piling up points, killing enemies, and advancing through levels. This game, created by Ryan Green and first presented to the public in 2013, uses the technology of video games to let players vicariously experience an unusual topic, that of raising a child diagnosed with terminal cancer. The story is based on Green's own experience with his son Joel, and differs from a typical video game in many ways, beginning with the fact that the outcome is known—cancer is going to win. Some of the objects included in A History of Video Games are exactly what you would expect to find (call them consensus choices) in such a volume, such as the games Pong (1972), Space Invaders (1978), Pac-Man (1980), Tetris (1984), Super Mario Bros. (1985), The Sims (2000), and World of Warcraft (2004). Books and objects which played key roles in the development of video games are also included, such as the Digi-Comp Computer (1963), the book 101 BASIC Computer Games (1973), the table-top game Dungeons and Dragons (1974), the Nintendo Entertainment System (1985), and the Sony PlayStation 2 (2000). Reading through this volume will give you an appreciation for how much computer technology has changed over the years. For example, the first video game to be demonstrated in public, Tennis for Two (1958), was built at the Brookhaven National Laboratory using equipment like transistors, fuses, and an oscilloscope. To take another example, the technology available when Adventureland (1978) was created could only accommodate two-word commands, which had to be drawn from a vocabulary restricted to 120 words. A History of Video Games notes that although the public face of gaming development may be presumed to be young white men, women and African Americans also made significant contributions to the field. For example, Gerald Lawson, an African American engineer, created the Fairchild Channel F, the first gaming system that allowed the use of interchangeable game cartridges. Women noted for their work in video game development include Alexis Adams, Joyce Weisbecker, Carol Shaw, Robert Williams, Christy Marx, and Mabel Addis. You may not agree with all the selections (two gamers, three opinions, don't you know), but if you have any interest in video games or popular culture, you'll find something to enjoy within this volume. Each entry is introduced by a two-page spread including at least one photo plus a boxed summary stating briefly why the game or object is important. Each entry is relatively short (typically four- to six-pages, including photos plus pull quotes and sidebars), and the bold color choices, particularly on pull quote pages (e.g., white text on a bright red background or black text on a bright yellow background) just add to the fun. Each entry is self-contained, making this a great book for browsing or taking on an airplane, and the inclusion of endnotes, a bibliography, and an index, make it easy to follow up on any entry that catches your eye.